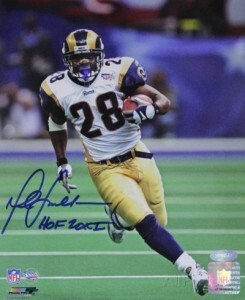 Marshall Faulk cards and autographed memorabilia have a loyal collector following. Faulk enjoyed early success in college and was a three-time All-American at San Diego State University. 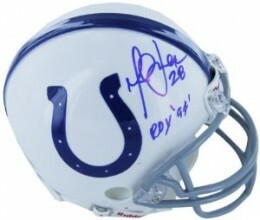 He would go on to be drafted by the Indianapolis Colts with the second overall pick in the 1994 NFL Draft. 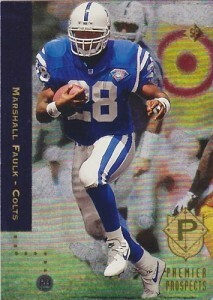 He spent 12 years in the NFL, splitting time equally between the Colts and the St. Louis Rams. 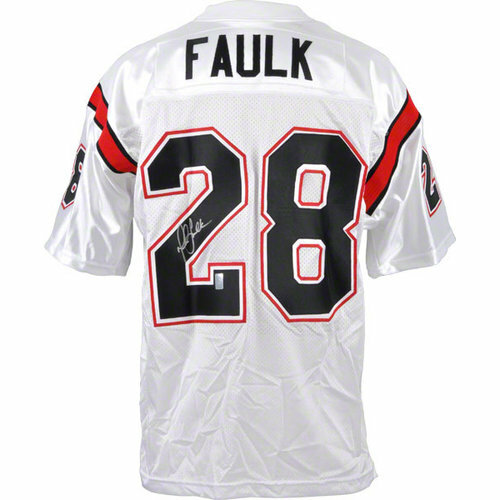 Faulk was selected to the Pro Bowl seven times and is a former Super Bowl champion. He is the only player in NFL history to have totaled 12,000 rushing yards along with 6,000 receiving yards. 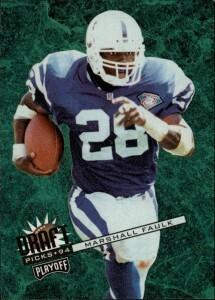 Marshall Faulk's rookie cards are all relatively affordable in ungraded condition. He has 21 rookie cards in total. Some of them can command a premium when submitted for professional grading and returned with high marks. Faulk has no pre-rookie cards. He has several other cards that were issued during his rookie year, most of which are insert cards. This includes his first certified autograph card. The 1994 Classic Draft Days Autograph card has an acknowledged print run of 10,000. However, the cards are not serial numbered. 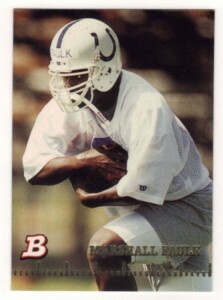 Faulk's first memorabilia cards were released in 1996. He has a game-used ball card in 1996 Collector's Edge Advantage. 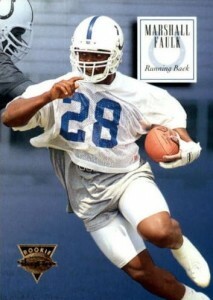 He also has a game-used jersey card in 1996 Upper Deck Football. It is one of the first football memorabilia cards ever produced and represents a key moment in the hobby. It is a highly desirable piece of football card history. Marshall Faulk's autographed memorabilia sells for a premium due to his Hall of Fame status. He is a willing in-person signer and does participate in organized signing events. This is one of Faulk's most submitted cards for professional grading. It carries a substantial premium when returned in high grade. It can sell in the upper-hundreds of dollars in a grade of 10/10. A die-cut parallel of the card also exists that is very popular with collectors. The Playoff Contenders brand has a long and established reputation with collectors as a premium rookie offering. There is no exception when it comes to Faulk's version of the card. It is highly desirable and carries a premium when in high-grade condition. 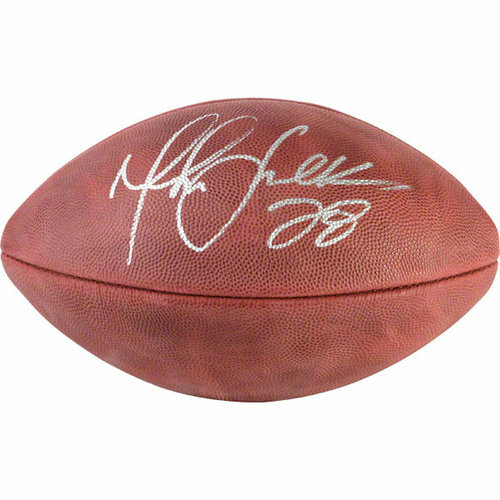 Below you will find examples of what an authentic Marshall Faulk autograph looks like. This can be used as a first point of reference for determining the legitimacy of autograph memorabilia, but is not a substitute for having your items authenticated by a well-respected professional autograph authentication company. Some of the trusted sources within the sports memorabilia market include the following companies: PSA, JSA, Tristar, and Mounted Memories. Click on any of the images below to view full size photos. The entire signature is very consistent and written in cursive on an even horizontal plane. The letter "M" starts with a short vertical line. It then dips down before beginning an elongated loop in the shape of a cursive, lower case "l". It rises well above the horizontal plane. The remaining letters are implied. The only exception is that one of the letter "l's" is written as a wide and bulbous loop. The "F" resembles more of a upper case, cursive "J." The letters "l" and "k" are discernible with the "l" looking more like an "e."
The "k" is printed with an extending tail to the right.